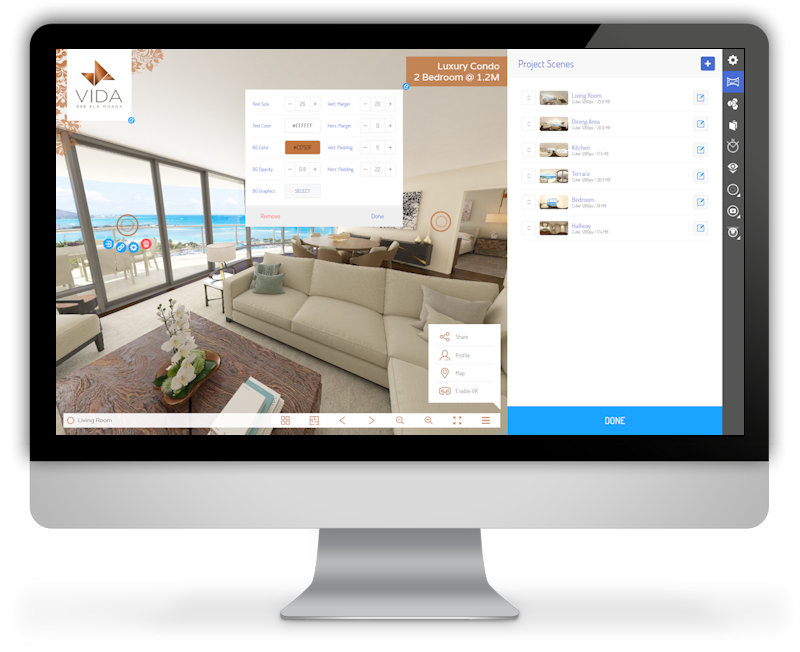 Create, customize, design, manage, and publish your 360 virtual tours online fast and easy. Customize each of your project's design to suit the client website, product, or brand. Save your design template and re-use later when needed. Easliy manage your projects and the porfiles associates with them. Create more profiles and for yourself or your clients. Add, edit, or remove navigation throughout the project scenes. Special popup hotspots to allow to display detail photos, videos, or text. Integrated behavior tracking provides an insight into every project, every scene and every detail your visitors are engaging. Restrict access to selected projects with access keys and expiration settings. Generate access keys and email them to friends or business associates. Extend the functionality of your projects with Addons that can convert any project into a powerful sales and presentation tool.